I started out playing the viola when I was four, and that’s what induced me into the performing arts. The reason I started liking dance, predominantly, is that it is a stress relief. In middle and high school, I was really in my head, overthinking everything. "Dance put me in the moment, which is something I struggled with through my childhood." My little sister danced. In seventh grade, I started watching YouTube videos and learning from my sister. I did gymnastics early on, but I wasn’t huge on dance until I hit high school. I did ballet, jazz, and tap—the primary three. In addition to my regular academic high school, I went to a musical theater conservatory, the New Orleans Center for Creative Arts, where I got to explore into contemporary, modern, and West African dance. Through my junior year of high school and first semester of senior year, I was actually pretty intent on auditioning for a BFA, musical theater, or acting program. But my teachers very much saw me at a large research university. The very first dance group I joined here was University Ballet (UBallet). I was cast in Giselle the fall of my first year. Then I choreographed a piece for Rhythmic Bodies in Motion (RBIM). I had choreographed a little bit for some musicals in high school, but I had never done pure dance. It was a full six and a half minutes for a dance concert. I saw the UChicago Maya show “Kaleidoscope” that same winter and got totally hooked. This year, I danced in their winter show, “Beacon.” I stopped doing UBallet because for now I’m focusing on RBIM and Maya, but I might return to it my third or fourth years. Long term, I’m considering data science and cognitive psychology—maybe a Ph.D. related to social psychology…or maybe I’ll audition for an MFA in dance or musical theater. I’ve looked at some programs, but I’m hoping that with a double major I’ll have many different options. I would like people to know that there is a tap group that one of the dancers in Maya and RBIM has restarted. It’s called Tap That. It’s based off of the old group from four years ago. We’ll really start kicking off next year. I grew up in jazz, ballet, tap—the basics. In high school, I did an intensive at the Houston Ballet, which was one of the best experiences of my life. But ballet is very technically based. What’s considered “good” is a specific form or body type. It’s very rigid. Although I relished that and the technical environment—because I’m kind of a perfectionist—I think that contemporary [dance] allows for more self-expression. That’s what most important about dance: being able to express yourself and impact others. It’s also a de-stressor—like killing two birds with one stone. I’ve been in Maya since my first year here, and I recently joined PhiNix this past fall. Maya is a fusion group where we combine Western and Eastern styles. But really, it’s just the styles of the choreographers and dancers, so it evolves with the organization. Every winter, we have a concepts show with an overarching theme. PhiNix is a hip-hop group, which is more of a crowd-pleaser in general. You just want to get the crowd excited. It’s a different kind of goal. I grew up in ballet, so at first it was really hard for me to break down the posture and everything that I’d been told. Hip-hop is the exact opposite, but I wanted to get out of my comfort zone. I only started choreographing when I got to college, and it’s an entire battle of its own. I think that the strongest pieces I’ve created are based off of specific moments in my life. “Bad Blood” was based on a moment of personal significance to me. There’s a lot that I was trying to release—and to help people understand another person’s perspective through choreography. "The thing that motivates me the most when it comes to performance is when somebody says, “That really touched me, and I can’t explain how.” Sometimes they say, “I felt moved.” It’s not always explainable, but sometimes things resonate with you." I get a lot out of having intimate relationships with people, so I want to be a doctor—either primary care medicine or reconstructive plastic surgery. I know they’re super different, but, as a primary care physician, you have the greatest ability to create a bond with your patient. I’m president of Ballroom Latin Dance Association (BLDA), and I competitively dance with BLDA. I love swing dance and am really involved with Chicago Swing Dance Society. 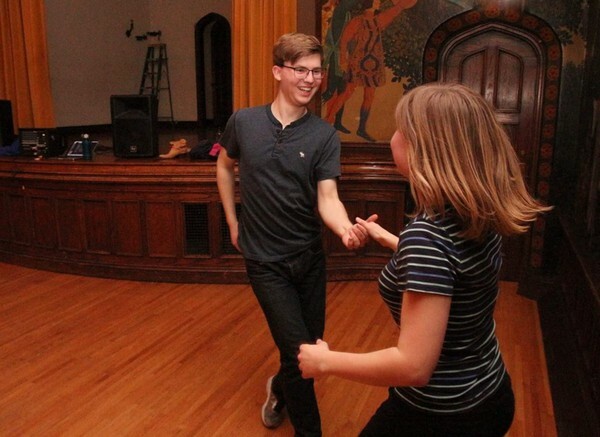 I also go to dances around Chicago when I have time—swing, blues, and occasionally Latin. There’s two parts of BLDA. There’s the competitive ballroom team—currently 40 people—which dances “dance sport” competitions across the Midwest. It includes waltz, Viennese waltz, tango, foxtrot, quickstep, cha-cha, rumba, samba, mambo, jive, and swing. There’s a total of 19 official ballroom dances, and I have competitively danced 17 of them—all entirely different dances. At competitions, you’re dancing with a partner, and there’s about a hundred couples. You get put into heats, and judges will cut each heat in half. Then you do it again and again until you have a final eight couples. Those couples will dance and be placed. This is an all-day thing—from waking up at 4 or 5 a.m. and going until 7 p.m. The other half is social Latin dancing. We teach salsa lessons for beginning and intermediate dancers. This quarter, we’re doing bachata lessons. We have those weekly throughout the quarter, as well as salsa at the Promontory. It’s a monthly event at the Promontory—a salsa social. It’s our main thing that people know about. When I came to college last year, I had already done social swing. In Olympia, Washington, there’s a weekly Tuesday night swing dance, and a lot of people go to it. It’s even better than some Chicago swing dances to be honest—even in tiny Olympia. People who went to my high school would go every week, so I decided to go more because I really enjoyed it and wanted to get better. Chicago Swing Dance Society—they have Saturday night swing dances. I would always go. At the same time, I went to a bunch of swing dances in the city. I usually know people there. When I came here, I wanted to learn how to waltz. Something I really wanted to do–a really college thing—just to learn how to dance. "I love dancing socially, but I never thought I wanted to competitively dance. I just got sucked in." At my first competition—at the Newcomer level at Purdue—I won ribbons in three dances. The only reason was because I could stand up straight. Everyone was dancing terribly, but if you have good frame, you can do well. I went to every other competition that year. My first year, I was BLDA scheduling coordinator. It was a lot of administrative work. I ran for president because I want more people on campus to learn about what BLDA is and does: learning to dance for people who have never danced before. For people who think they can’t dance, that’s not true. It’s a great way to de-stress, and it’s a fun social event. Once you know how to dance swing—or salsa or bachata or any of the ballroom dances—you can go to a swing dance anywhere and meet new people. Ballroom isn’t fun, per se, but I like getting really technically good at dancing. Practicing up to six days a week for a couple hours a day, you can get very comfortable with your partner. I enjoy that process. After our main competition at Valparaiso this winter, I actually had a stress fracture in my toe. In the lead-up to that, I was practicing 10 to 15 hours a week for ballroom, and another two to three for swing. In the future, I’m interested in working in government, nonprofits, or politics—working for the public. I still see myself going to swing dances after I leave college. Check out the BLDA Spring Showcase on May 17 at 7:30 p.m. in Ida Noyes Theater. Editor's note: The original version of this article incorrectly listed the winter Maya show as "Begin," rather than "Beacon."